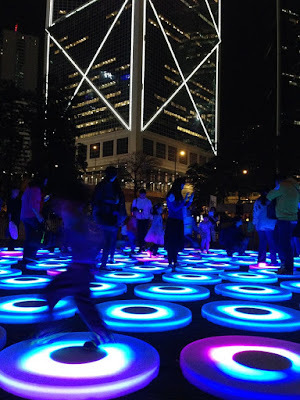 On Friday evening I finished working out at the gym and on my way home I heard music and saw some glowing lights at Chater Garden, across from the Bank of China Building. 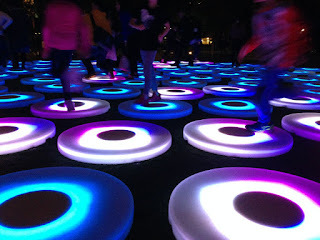 I took a closer look and saw in a circular penned area were colourful discs that changed colours when people stepped on them, and music played in the background. 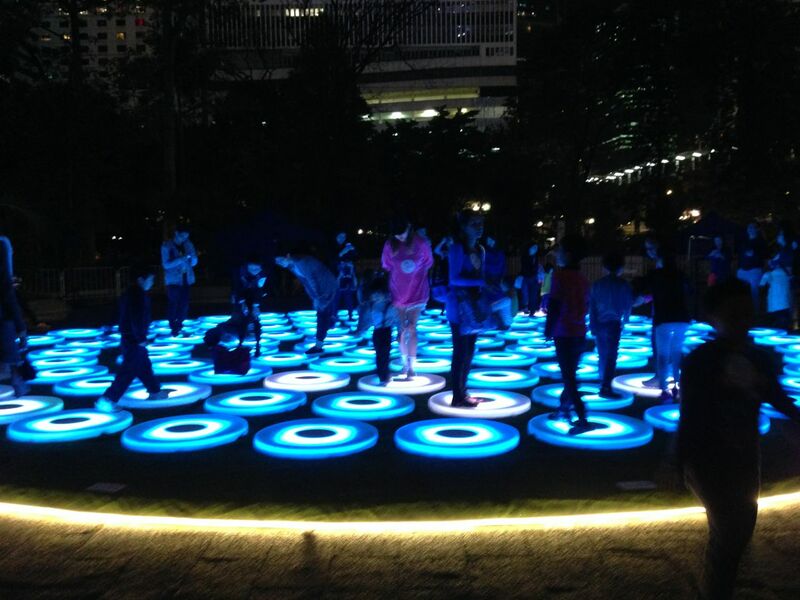 It turns out it's an interactive art installation called Super Pool by Jen Lewin, an American artist based out of New York. She is known for combining light, sound and complex engineering to create art installations that use LED lighting. 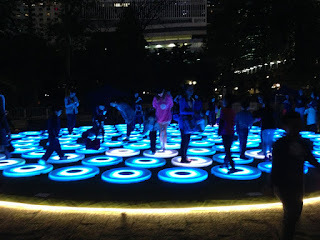 One of her best known works is called Pool, that uses over 200 LED-lit platforms that change colour according to the pressure and speed changes of the person stepping on it. The Pool Around The World from Jen Lewin Studio on Vimeo. For Super Pool, over 100 of the LED-lit pads are used. 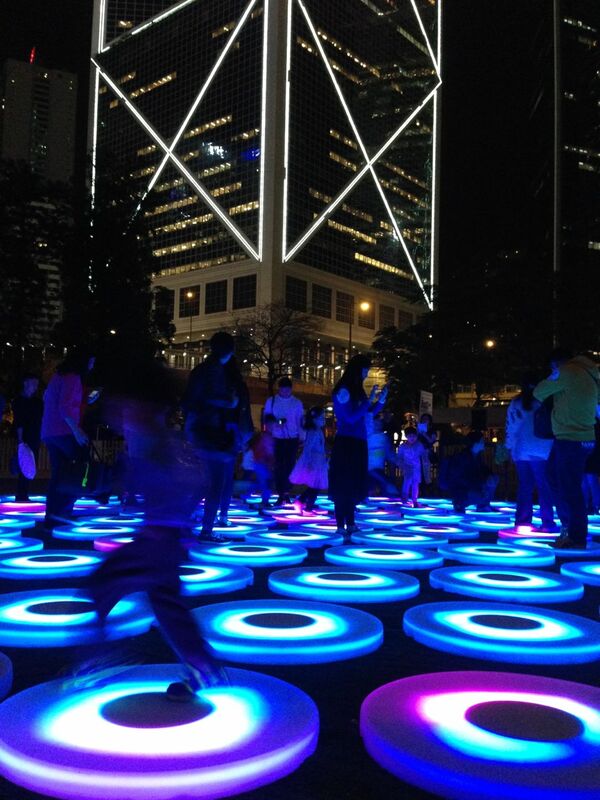 The installation is part of the 45th Hong Kong Arts Festival that just kicked off last Thursday and it has since moved on to either Tsim Sha Tsui or Tsing Yi because tonight Super Pool is already gone from Central. Nevertheless, I managed to get inside to try out Super Pool myself and it was the perfect playground for kids to run around, while adults were busy taking selfies. Super Pool is even cooler at night with the pads glowing from blue to aquamarine to magenta. Visitors could play at Super Pool for about half an hour until the next batch of people are allowed in, but really 15 minutes was plenty. Afterwards we were encouraged to Instagram pictures we had taken and add #superpoolhkaf so that it would appear on its own account on a large screen and we could even get our picture printed out for fun. 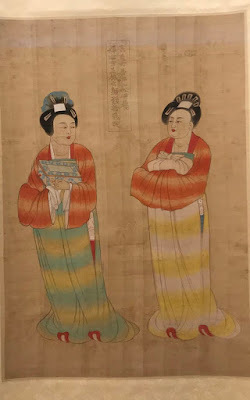 While most people probably didn't understand the artistic value of the piece, it was definitely enjoyed by a lot of visitors who had fun playing with lights and sound on a Friday night.